Ketty Clift certainly didn’t think so. Having embarked upon cruises for the greater part of her life, being aboard a luxury ocean liner was almost second nature. But this is her very last cruise, and, in classic Ketty fashion, she wants to go out with a bang. 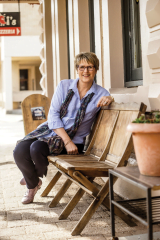 Thing is, Ketty is on a mission: she plans to transform the lives of every person who joins her at the dining table each evening. No small feat, but Ketty is certain she can pull it off – after all, she is a professional dressmaker who can turn Cinderellas into princesses with her keen style-eye, and she knows she has a talent for bringing people together. As the trip progresses however, and the glamour and glitz of the cruise take hold, Ketty realises that her fellow travellers may not be so easily transformed. A troubled family, grieving widower, and angry divorcee determined to avenge her ex are going to require a lot more work than Ketty had anticipated. To make matters worse, Ketty’s long-lost lover, Leo – the man who broke her heart – arrives onboard unexpectedly and there’s troubling news from home. Will Ketty’s last cruise be the one that finally defeats her? Tricia Stringer’s Table For Eight is a heart-warming novel that celebrates friendships old and new, reminding us that it’s never too late to try again. As Tricia’s first women’s fiction novel, the book is a testament to her versatility as a writer. 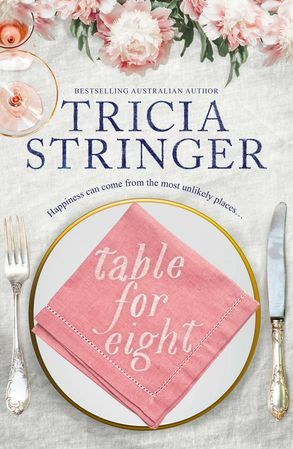 There are some aspects of Tricia that we know and love in this book – the warmth and charm of her prose and the life-like characters – but there’s also some great scene-setting with delightful depictions of Sydney Harbour, and witty humour that weaves its way throughout Table For Eight. The setting of the novel is an interesting choice – although cruising has become incredibly popular, it’s not every day you read a novel that is set on a cruise! The book is very relationship-driven, showing how life at sea has a way of pushing strangers together and creating bonds. If you enjoy stories that explore connections between people and pay tribute to the endurance of love and friendship, you will love Stringer’s new novel. Table For Eight is a beautiful book that transports the reader from the stunning blue harbour of Sydney, to the deeper waters of the South Pacific, in total luxury. If you’re looking for a getaway but don’t quite have the time or funds, look no further – this book is your next holiday. Pull up a deck chair and enjoy.